Today, it's time to unveil our first in-depth look at the game's design, featuring... well, me. In our inaugural episode, we talk about the ships, how they relate to one another, what they mean for gameplay, and the ways that you can customize your fleet. If you have an interest in the under-the-hood design of the game, check out the video. We'll have more design goodness next Tuesday. The community continues to amaze us with their creativity, support of and passion for Descent: Underground. For those new to the Descent flight model, Tron explains what six degrees of freedom means. Jaxley gave us some great promotional images to adorn social media. Grab a few and use them to spread the word! And how often does a member of your community make you feel better about your own job? Well Drakona certainly made me feel that way. It is a work in progress and there is a story behind that which I want to share. One of the biggest things we believe in here at Descendent Studios is that there are talented people all over the world, and we welcome those artists, designers, writers, & testers with open arms. The core, drone bay, and Auger ship we have shown in engine were made by someone we discovered from our own community Kajisan. Both he and Erio (gameplay programmer), have been very involved in the making of this project, and are a welcome addition to our Dev team. There is nothing better than finding creative talented people and shepherding them into this wonderful world of video game creation. With that in mind, I thought I would highlight a few others in the community that are making an impact. Goznik is making a Hummingbird ship. Keep up the good work - we love the concept of it so far. Firedragon is now focusing on weapons. 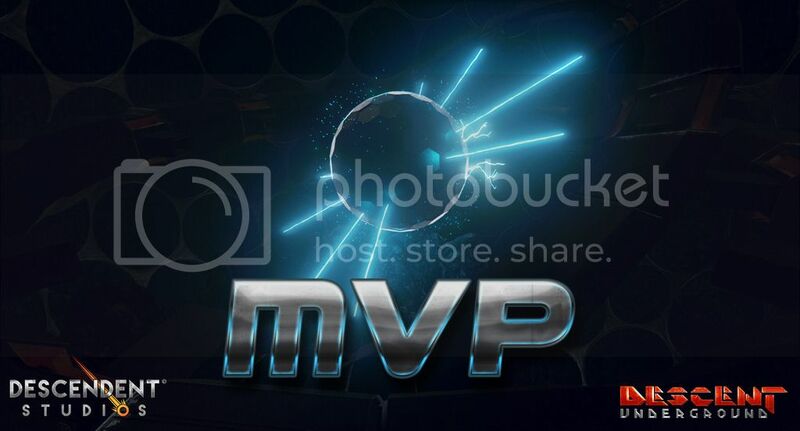 He also has some really cool ship stuff going on for which he won the MVP award earlier - well done FireDragon! JazAero is making a Parrot style of ship. Jazz is a very talented 3d modeler and an actual pilot so we are happy to have him in our community. And finally we have some folks out there creating banners to help us spread the word, a big shout out to Jaxley for your amazing work. It has been a FANTASTIC week for all of us Descendents! This week alone over 1200 more backers have joined our ranks. We've had some excellent press coverage, but more importantly, you've championed the cause -- and it shows, and WE LOVE IT! Please keep up the good work it is making a difference. In addition to creating fantastic ship concepts and prototype levels, our art team has worked up some cool new concept HUD UI. The thumbnail is preliminary but gives you a feel for the direction the HUD is leaning. Come to the forums to check out the different color schemes and add your thoughts. In case you missed it yesterday, Wingman and Rob's livestream was a doozy -- well mostly. Join us every Thursday at 10am CDT on our TwitchTV channel for the latest livestream. Also due to the demand from gamers that wanted to contribute through PayPal, but are unable to via Kickstarter we've opened the Descendent Studios store. I just could not wait, here is a better look at flying through the map we are kit bashing. What that means is we are building the pieces that modders will be able to use to build their own versions. And we are seeing how things scale etc. Here is a look at where we are, you saw this last week, and you can see some of the progress we are making in getting this together. 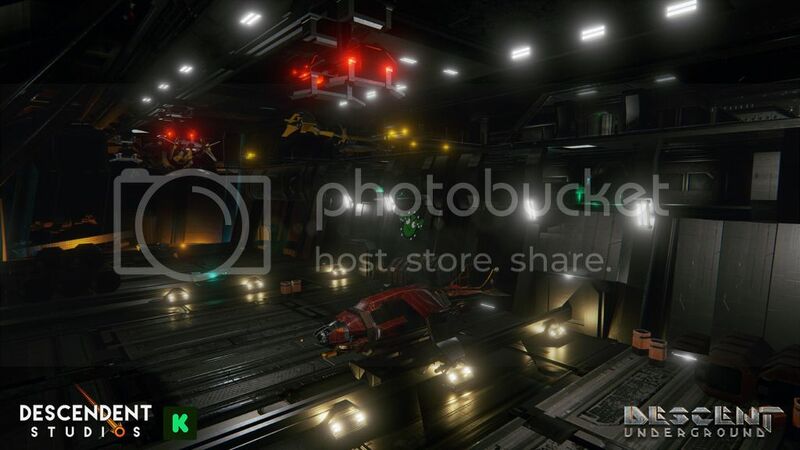 Anyway, I just could not wait to share this, and my continued THANKS to every single one of you for helping us bring Descent back - and letting a new generation experience the thrills and challenges of flying in true six degrees of freedom. And with VR support - maybe we include a boxed copy with a Descendent Studios Barf Bag? Thanks for your continued support and keep spreading the word, that is how this will all happen. Today has been another amazing day on our Kickstarter campaign! With your help, we hit the What's Popular Kickstarter list, and we are reaching more and more people who want to see the rebirth of true six-degree-of-freedom combat. More than 600 new backers have joined us in the last two days! Thank you all for your support and for continuing to get the message out that Descent is truly returning! For those of you hungry for more awesomeness, we offer a first glance at the fearsome TYPHOON! The Typhoon is the front-line assault craft for pilots who believe that the best defense is a good offense. Its only purpose: to destroy your enemies. Drone pilots everywhere fear the distinctive silhouette of the Typhoon's unique tri-winged configuration. While not long on defense and not the fastest vehicle in your fleet, the Typhoon is amply loaded with guns, missiles, and countermeasures so that it can have the first- and last - word in any conflict. Another Fantastic Day! 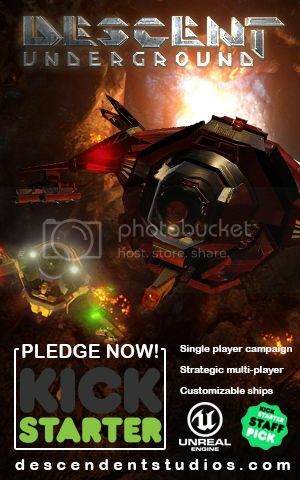 Over 3500 Backers! It's been a great day for the Descent: Underground project. We are continuing to build momentum and this, in large part, is due to all of you spreading the word. So keep it up, that is how this will happen - sharing, spreading, shouting, or heck, simply talking over a beverage, whatever it takes. Also, check out this AWESOME article in Ars Technica today. Clearly they want a great 6DoF vehicular FPS to play, and like all of us can't wait to power up and take flight with Descent Underground. Also check out the interview with me -- Phil "BlueDog" Tittle. I'll do my best to keep Wingman in check!! Ha! Some things to look for over the course of the next several days: a sneak peak at a new level, 3d concepts of the assault ship, fan art, our next MVP, design updates, and a broader discussion about the game and our business model. And we love our friends at Portalarium, we'd like to thank them at Shroud of the Avatar for the shout out. Top notch MMOs are too few and far between. And the team is well worth your support. Shroud of the Avatar: Forsaken Virtues is a new type of third person fantasy RPG that combines a single player narrative with a sandbox MMO. It is being created by a team that includes: Richard "Lord British" Garriott the creator of the Ultima series, Starr Long the original Director of Ultima Online, and Tracy Hickman the author of the beloved Dragonlance Novels and Dungeons & Dragons modules. Shroud of the Avatar has a classless character system, unique deck-based combat, consensual PvP, Guild Warfare, persistent player housing, and a rich, episodic story. Shroud of the Avatar is a crowdfunded game with Early Access available now! Learn more about it on Steam Early Access or www.ShroudoftheAvatar.com and if you like what you see then pledge your support!